Meet the total body trainer with zero impact. 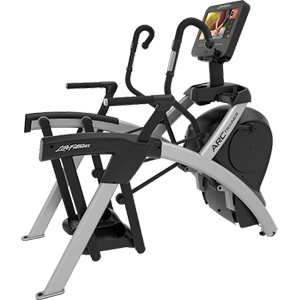 The Life Fitness Arc Trainer is 3 machines in 1, designed to help your clients and members burn calories, build power and gain strength. Ease on the joints: The patented Arc pattern of motion allows the hip and knee to move synchronously while the foot stays under the knee, reducing stress on joints and providing a more comfortable workout. The Total Body Arc Trainer is ideal for all users looking for a challenging cardio and high-intensity strength and power workout. It has moving arms with multi-grip handles and lower-body stride, to ensure an engaging total-body workout. Discover more at Booth #1530 at the Fitness Show, Sydney (Trade Hall Upstairs) or watch the video below.